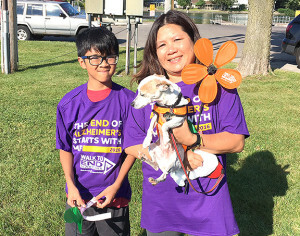 On Saturday September 17th three of our facilities- Generations at Rock Island, Generations at Regency, and Generations at Neighbors participated in the Walk to End Alzheimer’s. Our facilities prepared weeks before by fundraising for the walk. Each individual facility set a financial goal and worked towards that goal in various ways. Generations at Regency hosted a series of $5 drawings for “pie in the face.” The drawing consisted of the winner picking from 10 department heads who they wanted to pie. It was a messy but delicious treat! They also set up donation jars around the facility as well as sold Alzheimer’s bracelets for $1, wacky scrubs day for $2 and grill out day with hot dog and chips for $3. Generations at Neighbors hosted a raffle and special corn boil to raise funds for the walk and Generations at Rock Island also held various fundraising efforts throughout the facility. All facilities also promoted their fundraising efforts on Facebook and Twitter. These three facilities are the hub of Generations Healthcare Network Alzheimer and dementia wards. Though all facilities offer residents care for these illnesses, the three facilities has special units and programs that help individuals to maintain optimal level of independence and quality of life in a secured and safe environment. Our staff, their friends and family could not have asked for a better day. It was bright and sunny with great weather for a walk. At each location the crowds were big and buzzing with excitement. Some individuals carried colored flowers that represented why they walked. Orange was for walkers who want to see a world without Alzheimer’s/dementia. Blue was for walkers who have Alzheimer’s/dementia. Purple was for walkers who have lost a loved one to the disease and yellow was for someone who is currently caring for or supporting someone with Alzheimer’s/dementia. 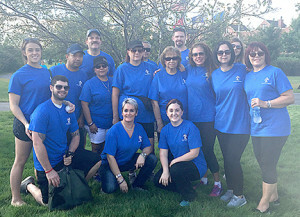 Our teams were so happy to fundraise and participate in the walk. Generations at Regency raised 71 percent of their goal while Generations at Neighbors raised 93 percent of their goal! 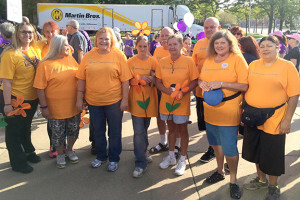 The event is the world’s largest event to raise awareness and funds for Alzheimer’s care, support and research. Our facilities cannot wait for next year!